The FLIR MR05 upgrades your FLIR moisture meter to help you easily test for moisture in challenging spots—on rough or uneven surfaces, in corners, in hard woods or high-density materials, and even, with ease, in areas without a dry reference. 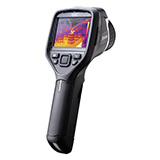 Made with extra-durable pins and a metallic impact plate that can withstand hammering to drive pins into the hardest materials, the FLIR MR05 lets you tackle the toughest moisture-measurement challenges all day long. Key features include six additional sets of thick and thin pins, an external pin accessory for the FLIR moisture meter mount for extended reach, a 1/4"–20 integrated wrench on the cap to replace pins, a durable BNC connector, a 2 m coiled cord, and a 2 year warranty.